I had been waiting to see Sachin Tendulkar taking on Shane Warne from the day IPL 2 @ kicked off and i know cricket fans across the world were anxiously waiting for the same. It would have been really one of the best on field battle between you could ask for between legendary players all time..
Mumbai Indians were racing up to take on Rajasthan Royals after defeating Chennai Super Kings at Inaugural match. 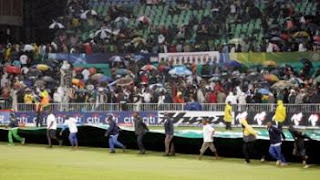 But rain was too persistent in Kingsmead stadium -Durban ,which played a spoilsport as the high-profile match between Mumbai Indians and Rajasthan Royals was called off without a single ball being bowled. Since the match was abandoned, the two teams shared points. Now Mumbai Indians still undefeated in the series so far have moved to the top of the table with three points in their kitty. Catch the next match when take on scheduled for 25 April at Durban.